If you are looking for that beautiful countertop for your remodel or new construction project come visit Moonlight Tile and Stone today. We pride ourselves on providing outstanding customer service to our customers and beautiful hand-crafted custom countertops at a competitive price. We template, fabricate, and install your countertops out of our East Wenatchee facility. We offer a wide range of material for countertops, such as granite, marble, travertine, slate, soapstone, quartz, and recycled glass. We are Ceasarstone, Vetrazzo and Fuez certified fabricators. We are proud members of Building North Central Washington and the Stone Fabricators Alliance. Each year we continue our education in stone by attending the Stone Expo conference in order to provide our customers with the latest knowledge in the stone industry. As a family owned and operated business, we value excellent customer service and building our business locally, throughout the Wenatchee Valley. Come visit our showroom today to see how we can turn your dream into reality! Marinace Granite is quarried in Brazil. It’s actually a conglomerate rock. Check our Facebook for more featured products! 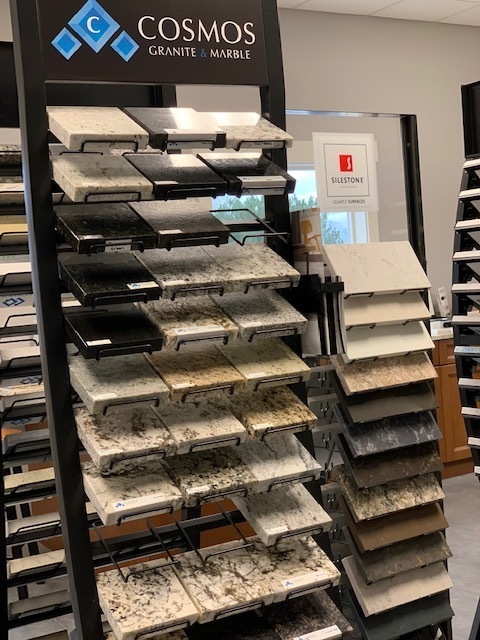 Come visit our showroom, with hundreds of samples to chose from, we can help your dream project become a reality. We pride ourselves on teamwork and a family friendly staff. Get to know the Moonlight Tile & Stone team!